This case describes a patient with symptomatic, severe primary MR deemed high risk for surgical repair, who successfully underwent MitraClip transcatheter mitral valve repair in the setting of an interatrial septal mass. 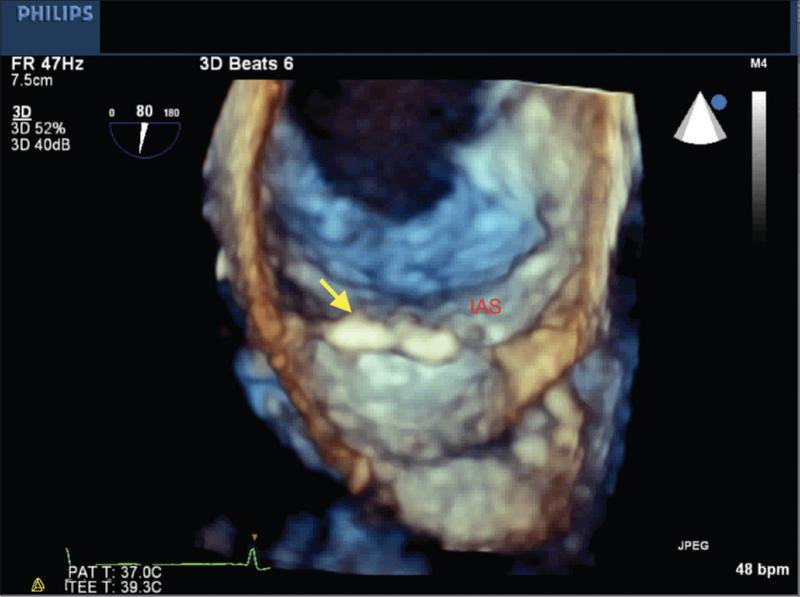 A 65-year-old woman with symptomatic, severe primary MR, who was high risk for surgical repair, was scheduled to undergo a MitraClip transcatheter mitral valve repair. She had favorable mitral valve anatomy [Figure 1]. She had a prior history of bioprosthetic aortic valve replacement for severe aortic stenosis, mitral annular calcification with a mean gradient of 4 mmHg at a heart rate of 56 beats per minute, pulmonary hypertension with an estimated pulmonary artery systolic pressure of 65 mmHg, and normal left and right ventricular function. 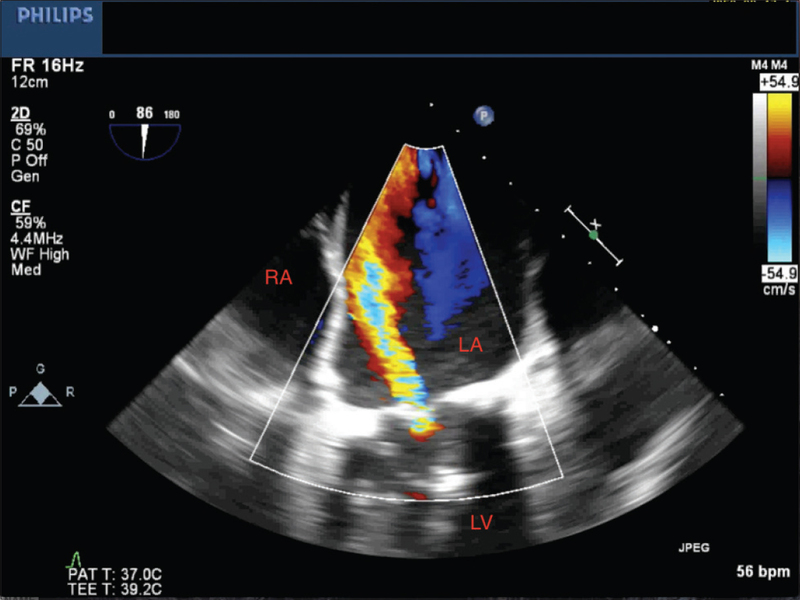 Transesophageal echocardiography (TEE) revealed a 2.0 cm × 0.7 cm nonmobile mass present superiorly on the left atrial (LA) side of the interatrial septum [Figure 2]. This was confirmed on three-dimensional (3-D) imaging and color-flow Doppler revealed the absence of an interatrial shunt [Figure 3]. It was recognized that the standard transseptal puncture for MitraClip in the superior aspect of the septum would be challenging in the presence of a closure device, and evidence of thrombus would be a contraindication to MitraClip procedure. Given that there was no clinical suspicion for thromboembolic phenomenon or history of prior transseptal puncture, the mass was most consistent with excess atrial septal tissue in the region of foramen ovale. The decision was made to proceed with MitraClip placement. LA catheterization under general anesthesia was performed by a careful posterior-inferior transseptal puncture using a BRK-1 Transseptal Needle (St. Jude Medical, Inc., St. Paul, Minnesota, USA) under TEE guidance, entering the LA inferior to the interatrial mass. 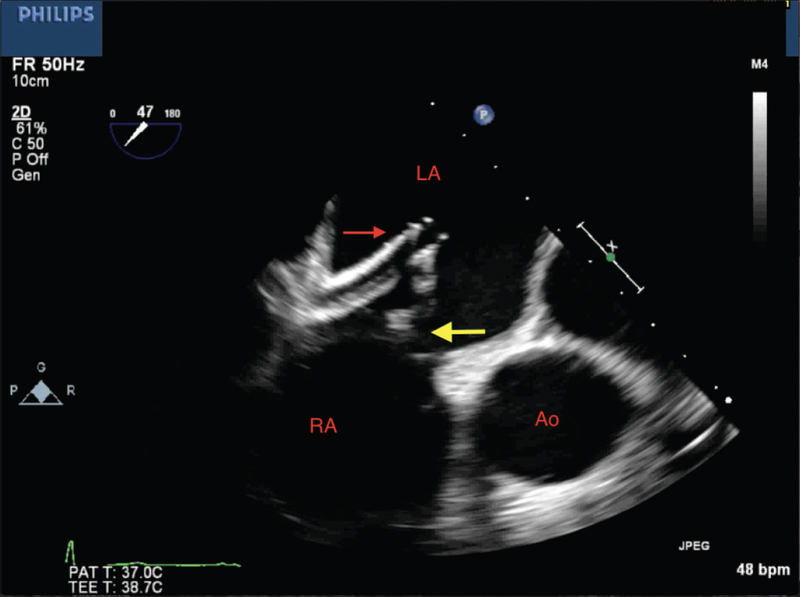 Despite a lower entry point on the interatrial septum, there was ~4 cm of height above the mitral annulus as the LA chamber was severely enlarged. The 22F MitraClip sheath and the delivery system were then advanced into the LA [Figure 4] and [Figure 5]. 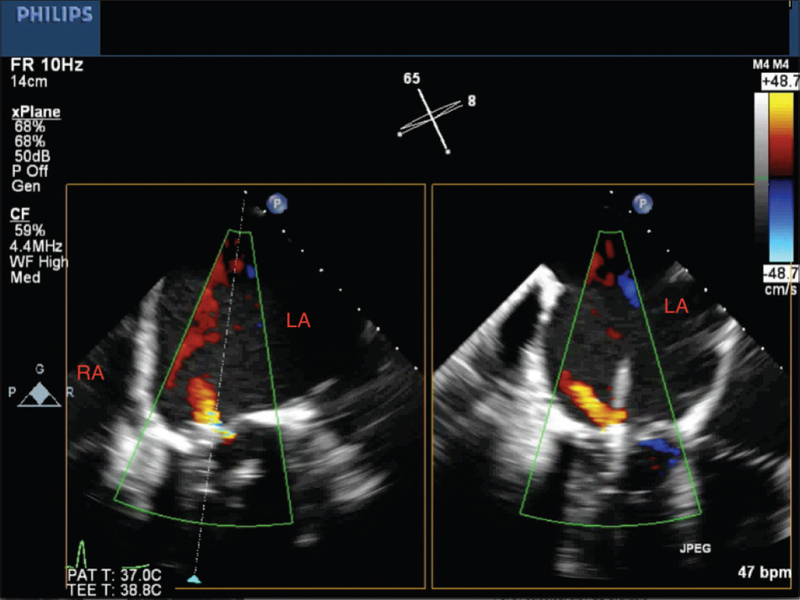 The MitraClip was successfully placed with mild residual MR and a normal gradient across mitral valve [Figure 6]. Safety and efficacy of MitraClip transcatheter mitral valve repair in the presence of intracardiac masses has not been described in the literature. 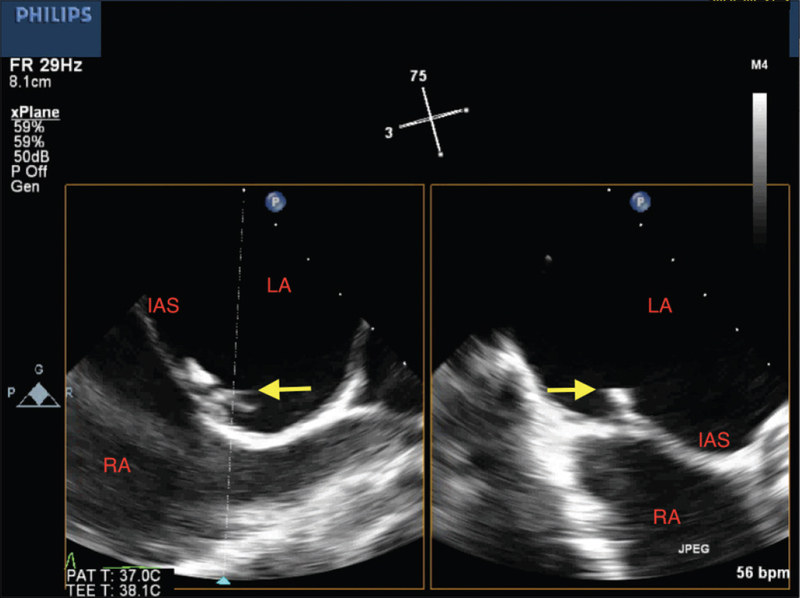 We describe the first reported case of MitraClip transcatheter mitral valve repair using an inferior-approach in a favorable LA anatomy in the presence of interatrial mass with low clinical suspicion for thromboembolism. Transseptal puncture represents one of the key steps in MitraClip procedure. In routine practice, optimal puncture site is located superiorly and posteriorly in the interatrial septum, approximately 4–5 cm above the mitral annulus, for adequate guide catheter and Mitraclip maneuvering. 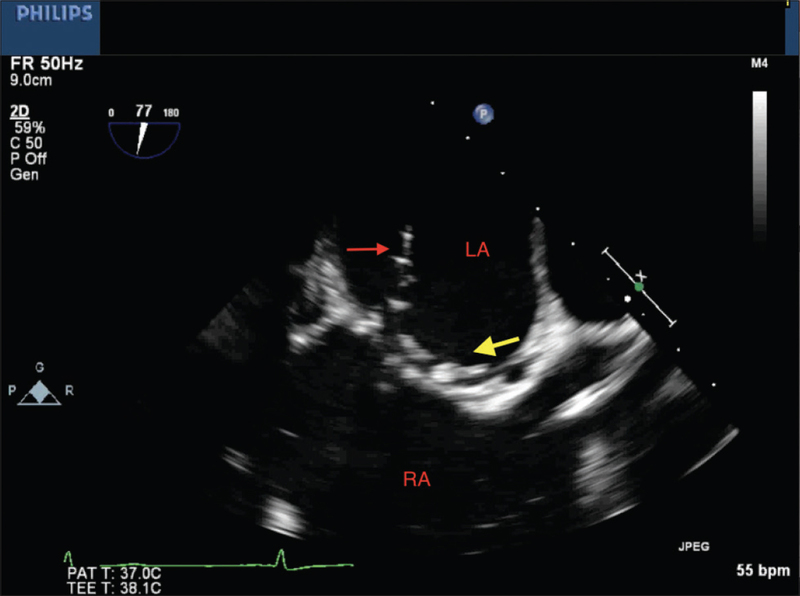 An enlarged LA may provide adequate depth for this maneuvering despite a relatively inferior transseptal puncture. Although intracardiac thrombus is a contraindication to the procedure, it may be feasible to carefully perform the procedure in the presence of relatively low thromboembolic risk interatrial masses such as interatrial septal aneurysm, lipomatous hypertrophy, or PFO closure devices. In high-surgical-risk patients requiring Mitraclip transcatheter mitral valve repair, it may be feasible to perform the procedure in the presence of relatively low thromboembolic risk interatrial masses such as interatrial septal aneurysm, lipomatous hypertrophy, or PFO closure devices. A detailed assessment of such masses using 3-D TEE, including determining etiology and embolization risk, is key before proceeding with the MitraClip procedure. Feldman T, Kar S, Elmariah S, Smart SC, Trento A, Siegel RJ, et al. Randomized comparison of percutaneous repair and surgery for mitral regurgitation: 5-year results of EVEREST II. J Am Coll Cardiol 2015;66:2844-54. Mongiardo A, Spaccarotella C, Mascaro G, Pasceri E, Santarpia G, Indolfi C, et al. Tips and tricks to implant a mitraClip in a patient with previous surgical closure of atrial septal defect. Int J Cardiol 2015;187:264-6. Açar G, Fidan S, Avci A, Alizade E, Esen AM. Unsuccessful mitraClip procedure due to emerging right atrial thrombus and difficult transseptal puncture: Saved by multidimensional transesophageal echocardiography. Herz 2014;39:1016-8.